If you read last week, you know that we have more cucumbers than we know what to do with. I've made over 40 pints of pickles, and there are still more cucumbers to be had. I made this cooling cucumber face mask and this cucumber sugar scrub, and we have this easy cucumber and tomato salad almost every night for a side dish. It's my favorite way to eat a fresh cucumber, and it just takes a few minutes to make. This isn't an exact recipe by any means. I usually just throw the ingredients in a bowl without measuring. Actually, my 8-year-old daughter has been making this once I chop the vegetables. Hopefully you'll be lucky and your cucumbers, tomatoes, and onions will all be ready at the same time for this delicious recipe. This gets a little soggy after it sits, so I make it just before I start making dinner. I put it in the fridge for the flavors to meld a little while dinner cooks. 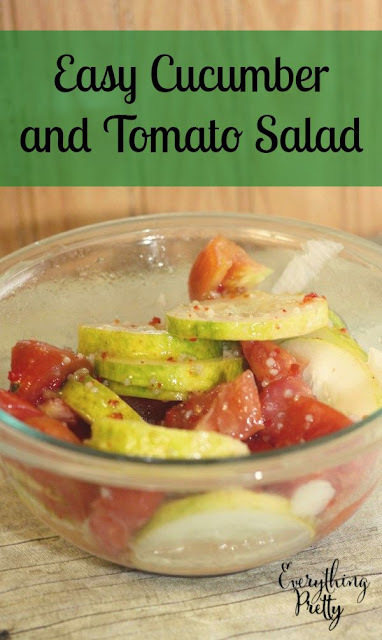 In a small bowl, combine 1 cucumber sliced thin, 1 tomato cut in to chunks, and 1/2 onion cut in to small slivers or diced (I used green onions from the garden). Pour about 1/3 to 1/2 cup Italian dressing on top and stir well. You want to coat everything with the dressing, but it doesn't have to be all soaking in the dressing. Just give it a good stir before you serve it, and it will all taste amazing. What's your favorite way to eat cucumbers?